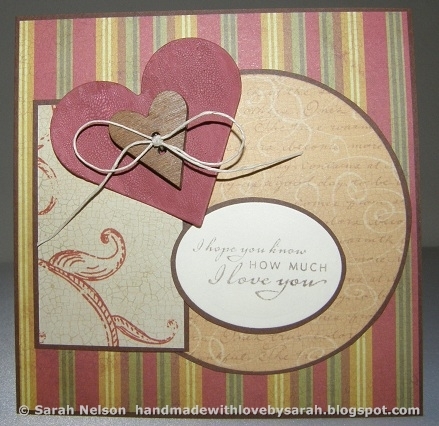 Handmade with Love by Sarah: The Last of the HYCCT Cards! The first card is for HYCCT1117. We were challenged to use paint. I'll be honest. My first thought was PAINT?! Then I remembered that I had some crackle paint, and I went to work in that direction. 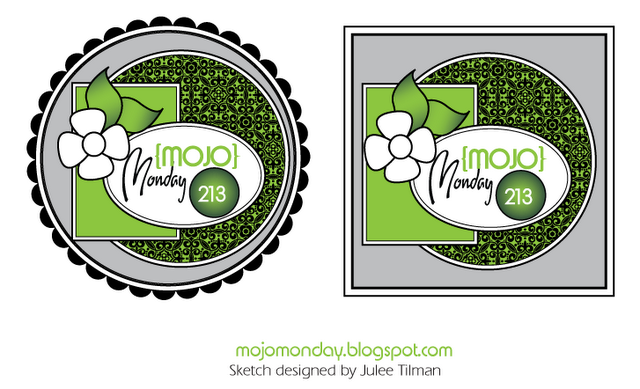 I used Mojo Monday sketch 213 again for the layout. 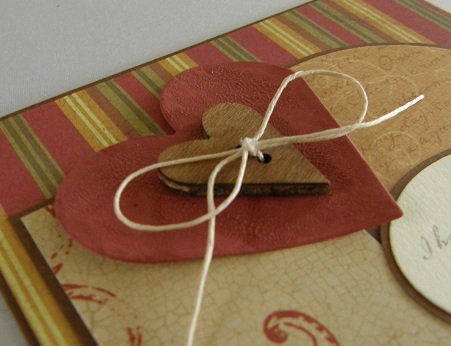 Here's a closeup of the crackle paint on the heart. You can see it slightly better when the card is flat on the table rather than upright. Papers: brown, ivory, dps from K & Co. Tim Coffey "Fall Mat Pad"
In HYCCT1128, we were challenged to make holiday cards using pink as a primary color in the color scheme. I went for all pink with a splash of glitter! Stamps: Our Daily Bread Designs "Ornaments 2"
Papers: white, DCWV "The Christmas Glitter Stack"
HYCCT1109 Look Up challenged us to use something that you would see when you look up into the sky. 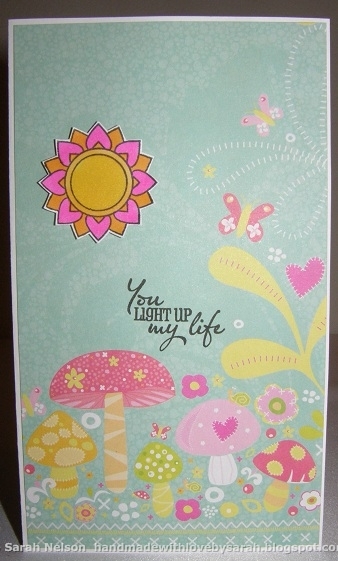 I decided to use the sun so I could use this fun Verve set. Papers: white, gold, dp from K & Co. "Berry Sweet"
I made a masculine thank you card for HYCCT1103. We were challenged to make a masculine card that included pink. 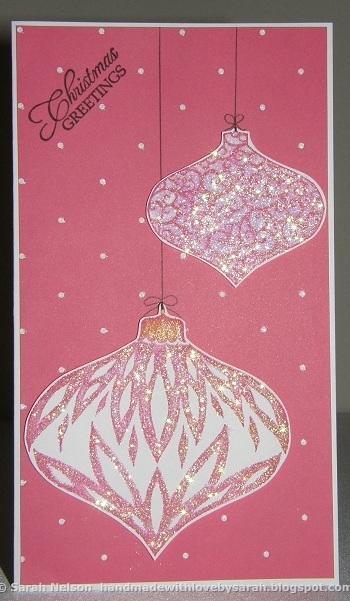 I thought this card would work as a winter or holiday thank you note for a guy. 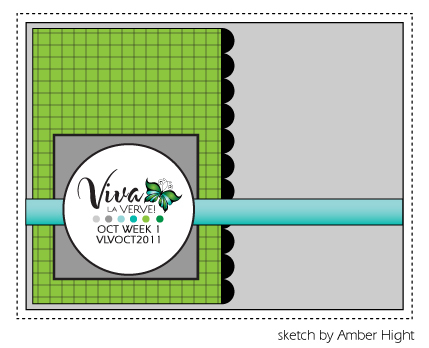 The layout is from Amber's VLV sketch for week 1 of October. Papers: white, brown, dps from DCWV "The Christmas Stack"
HYCCT1101B challenged us to Bling the Cling and use bling in our projects. 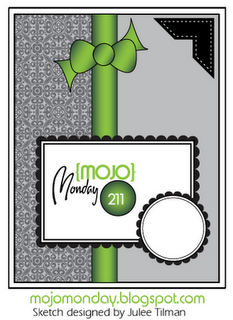 I used Mojo Monday sketch 211 for my layout. Papers: white, black, dp from DCWV "The Stack 5"
For HYCCT1131, the challenge was It's a Costume Party. We were challenged to do something completely different from our usual style. I attempted to make a CAS card. It is pretty CAS for me, but I know others might consider this a bit too busy to be CAS. So in defense of "my CAS style," I only have 2 layers on the white card base, a piece of dp and the cut out sun. 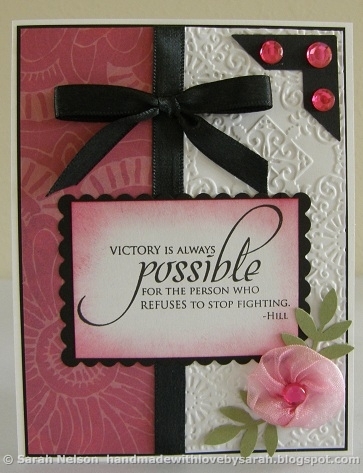 The sentiment is stamped directly on the dp. 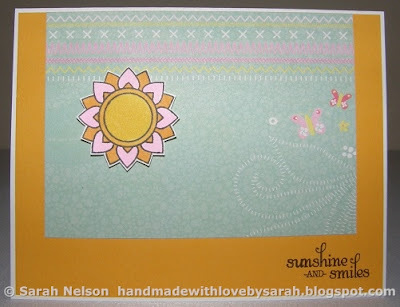 I stamped, colored, cut out the sun, and adhered it with foam tape. I did not use any flowers, ribbons, bows, border punches, dies, bling, fabric, twine, distressing (torn or sponging), embossing, or any other kind of technique. Papers: white, dp from K & Co. "Berry Sweet"
The last card is for HYCCT1106 Looking In On You. We were challenged to make a window card. 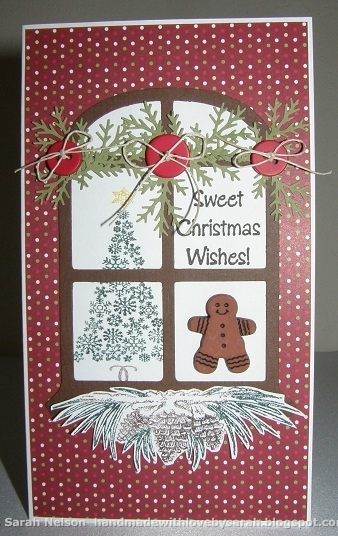 I used my new Spellbinders window die cut from Our Daily Bread Designs to create my scene. Papers: white, brown, dp from DCWV "The Christmas Stack"
Well, I am finally done with the HYCCT challenge cards. I had a great time making all of these cards and pushing myself to try some new techniques and styles. I hope you've enjoyed seeing my projects. Neat cards, love the 5th and last card the most, like what you did with the sketch 211, the black and pink is so pretty together. Your Christmas scene is so cute!